The best known breed of greyhounds indigenous to india is the Rampur hound so called from the native state in the united provinces, which is its place of origin. as to this origin no clear facts can be obtained, but the breed known to have existed in Rampur for over 200 years .From the Persia , and probably it was more or less regularly visited by Carvans from the north. What, therefore, would be more natural than for the Head–man to bring a present to the Nawab of a brace of the greyhounds, which were so valued in his own land? 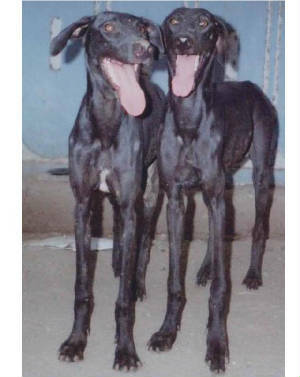 Compare for a moment the photograph of the smooth Arab hound and the Rampur, and a very strong likeliness will be seen. 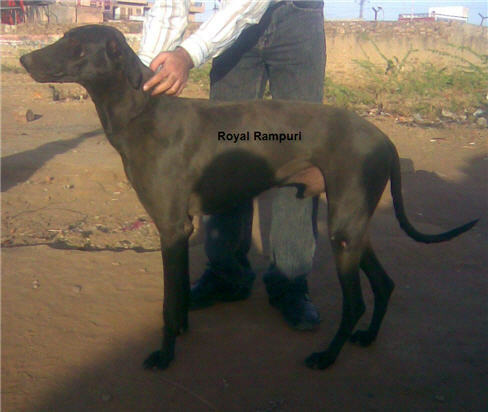 It is of course , probable that the Rampur was crossed with some other hound in the past which would also account for its greater size.The Rampur has been largely crossed with the English greyhound by sportsmen in the past ,not only to give more stamina to the English hound’s progeny, but also to improve the feet. The pure Rampur is slower than the English hound, but it will last when the latter has had to give up, not only from exhaustion, but from lacerated feet. The pure Rampur, now hard to obtain, has several very distinctive features. The head is more massive than the Persian hound’s, jaws more powerful, the general build more suggestive of strength and endurance than very great speed. The eyes are yellow and have the most uninviting look when the animal “means business”. The loins are generally well arched, and the tail is carried gaily, but not over the back. Of coat there is practically none,the resemblance to a recently clipped and singed horse is remarkable :the skin can be seen and the hair can be sharp and prickly. The colour is therefore the colour of the skin which is mouse colour. In the Royal era when hunting was a favorite pass time and hounds were bred for actual performance in hunting field. 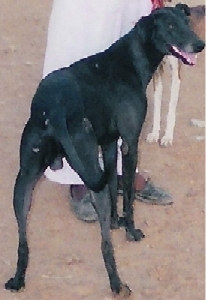 The outstanding hunting capabilities of Rampur hound made him favorite dog of Indian aristocrats. The dog possesses an exceptional personality which is the perfect combination of beauty, grace, speed, power, stamina, and aggressive hunting attitude, which makes him worthy for hunting big as well as small games with same expertise. No clear facts can be obtained about the origin of dog but the hound has recorded history of more than 300 years. Dogs are smooth coated with substantial powerful head, characteristic roman nose, powerful jaws, scissors bite, more straighter back, hare feet; and most importantly the aggressive and suspicious behavior which makes them such a wonderful hunter and good guard dog . Dogs are mostly black or mouse grey but other colours are found. Unfortunately some professionals are mixing Rampur hound with English and retired racing greyhounds. But such dogs lack true character of Rampur hound. Sincere effort is required to preserve true type of Rampur hound which are very few and in hands of tribal people in remote areas. KCI should also revise the standard written for Rampur hound.